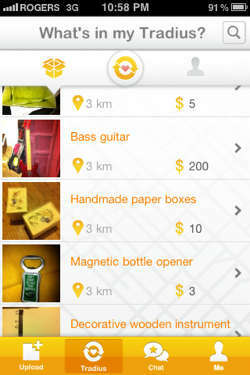 Tradyo, currently available on iPhone, allows you to see from your smartphone what goods–mostly used for the time being–are available for sale in your immediate area. It links up to your smartphone’s GPS system to figure out where you are, and then figures out where everybody with the stuff happens to be in your area. You can then, in turn, receive push notifications as to not only when someone has an interest in whatever it is you’re selling, but also whatever it is you may be interested in buying. Even better, it also packs in an in-app messaging ability that allows you to not only ask questions about an item, but also field them; you’ll be able to tell within just a few keystrokes if that thing you want is already sold to someone else, or be able to provide further specifics about an item you’re out to move. Tradyo further encourages its users to get their social networks in play, which gives them a wider network to work with, and eventually, more buyers and sellers in general looking to get rid of their excess stuff or just contribute to it. The more people using Tradyo, the more effective it will likely be. Naturally, this is the part where you start wondering about how this is any help to your small business. If you deal in goods–new or used–it’s likely to be something you’ll want to pay attention to, and for two key reasons. One, if you’re a bookstore and you see that a whole lot of people on Tradyo are looking to buy used paperbacks, then you want to be visible for those hordes who are out looking for copies of their favorite 80s-era science fiction or the like. Two, if you’re not a bookstore, but you can look on Tradyo and see that there are a whole lot of people looking to buy used paperbacks, well, then maybe you’ll want to consider opening some kind of concession to deal with these folks. So thus, Tradyo becomes not only useful as a way to sell your goods, new or used, as well as a way to find more to sell, but also as a potential roadmap toward new items you can offer at your current facilities. When you look to get in more clientele, of course, the next best thing to do is to follow up your marketing efforts with appropriate expansion in infrastructure, including some cloud-based telephony systems like hunt groups and even some Google Apps integration to ensure that you’ll be able to satisfy those extra customers gained from your marketing efforts. 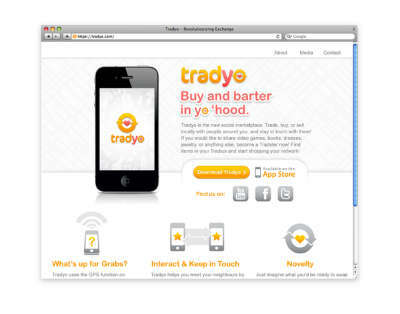 So while Tradyo may not be too valuable right now, it’s one to keep an eye on for future use in most any small business that deals in some kind of goods for sale.